PBXware 5 is culmination of years of hard work and passion we have put in our products in order to provide our customers with best experience possible. Besides completely new and modern look and improved functionality, Asterisk 13 is now running under the hood, allowing us to implement new features we previously were not able to. With introduction of Asterisk 13, PBXware is now using PJSIP stack, and although there will be no visible changes in the interface, this is one of the major updates in our latest version. PBXware is the world's first and most mature IP PBX Professional Open Standards Turnkey Telephony Platform. Since 2003, PBXware has deployed flexible, reliable, and scalable New Generation Communication Systems to SMBs, enterprises, and governments worldwide by unifying the most advanced of latest technologies. 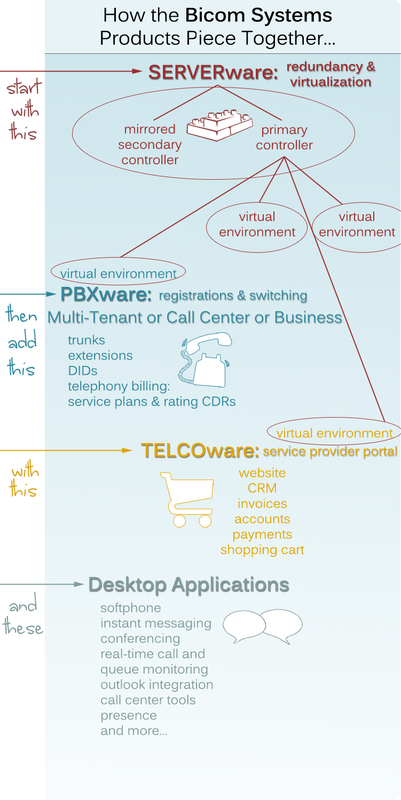 PBXware supports a wide range of PSTN and VoIP technologies. Hot Desking, Call Screening, ACD Queues, IVR Auto Attendants, Conference Bridges, CRM Integration, Least Cost Routing, National/Global voice networks, and much more are all deployable as a single unit or redundant network. A real cost saving solution! PBXware is delivered either in a CD, Appliance, or SERVERware delivery format, each with an easy to use setup wizard that will have your PBX functional in just minutes. Administration is performed through web interface or CLI. Auto updates, system backup, provider templates, call recordings, and real time call/agent monitoring are just some of the advanced features offered. We also welcome and deliver custom development in a professional and affordable manner. PBXware is offered in the Business, Call Center and Multi-Tenant Editions, each supporting specific features maximizing performance, reliability, and expandability. Can be used as a Class 5 SoftSwitch / voip switch. See below for full details. We are proud to introduce the entirely new design of PBXware GUI. PBXware 5 offers unified look across different platforms so all of the forms, alerts and pop-up windows will now look the same on all desktop devices. To further improve interface efficiency we have also integrated Setup Wizard parts into the main page. PBXware brings together Calls, Conferencing, Instant Messaging Chat, Faxing, Online Presence, Call Center Agents, Outlook/MS Exchange Directory, CRM integration etc. creating unified communications, giving our customers extended advantage in every day business life with our gloCOM Application. Your PBX is flexible with powerful setup wizard? PBXware supports VoIP and traditional PSTN telephony technologies allowing for legacy integrations. Some of the manufacturers supported are: Aastra, Alcatel, Grandstream, Cisco, Cisco SPA, Denwa, Htek, Panasonic, Linksys, Obihai, Polycom, Sipura, Snom, Yealink, etc. Here you may find a complete list of supported UADs. Does Your PBX take advantage of Open Source Flexibility? Do You have a Superior Support and Personal Account Manager? In order to further enhance PBXware experience and functionality we have specially developed a gloCOM - Unified Communications application for Desktop & Mobile platforms.. Looking to Start a Phone Company? gloCOM is a unified communications desktop application that offers businesses softphone, user presence, instant messaging, faxing, conferencing, and agent call center facilities all in one desktop instance. Although gloCOM 5 might not seem much di erent from user perspec ve as its interface did not changed much, underneath it is so much di erent that it is almost a completely new product. Flexible delivery methods? How about CD, Certified Appliances, SERVERware? PBXware Dashboard provides single-page overview of important PBXware information and statistics in real time. Here you are able to see information on running services, call statistics, licensing and gloCOM editions usage as well as hardware status information. Conferencing allows two or more participants to communicate with each other. Administrators can define user permissions and conference options as well as allow one or more participants to moderate ongoing conference calls. You can easy move your PBX to another physical location? Flexible delivery methods is what makes PBXware so popular on the market. To meet the needs of our customers we developed three different delivery methods: Software, Certified Appliances and SERVERware. Our PBXware CD installation is compatible with standard PC (x86) hardware giving you easiest and fastest way to install your PBXware with step-by-step setup wizard. Visit our download page and get your PBXware CD software installation. PBXware is also available with Bicom Systems Certified IP PBX Appliances as a fully working telephony system which is out of the box plug and talk ready. SERVERware 3 is a next generation Cloud based communication solution allowing ITSPs and Enterprises to offer Hosted Cloud based IP PBX's in a redundant, flexible and scalable server or cluster network editions. Would You like Your PBX to work with Custom Applications? Fax Over IP and traditional PSTN faxing allow communication between fax machines connected to a network (Internet) or/and to a traditional phone line. One of the interesting addition in PBXware 4.1 is option to set up a FAX cover page that will be sent out whenever users send faxes using gloCOM. Simplicity of use to company Admin is required? You value Easy upgrade to the next available software version? does not require root password in order to access it. Would You like all in one PBX system, with no additional software required? Does Your PBX supports a wide variety of handsets from manufacturers such as Snom, Sipura, Grandstream, Cisco, Linksys, Polycom, Aastra. Can You Monitor your PBX from anywhere? Are You looking for Cloud Multi Tenant ITSP Phone System? PBXware can be offered as a Cloud Hosted IP PBX by ITSPs and Telecom companies with no limitations on Resellers, Extensions and Tenants. Are You PBX reseller?We offer Branding + OEM. Your PBX helps you to lower Telecommunications Costs? the highest level of system availability possible. Your PBX provides Remote working features and remote access? PBXware features for their specific business needs. Your PBX Maintenance Cost is High, already tried to reduce it? PBXware is plug and play ready for integration with MS Outlook, Miscrosoft Exchange, Sugar CRM, Salesforce, Zoho, Microsoft Dynamics, Bullhorn, Zendesk and able to integrate with any customer custom CRM systems with our custom development services. Our Personal Account Managers will take GREAT care of our customers, provide FREE sales consultancy and to convey some of the experiences gained during several years of work in the telecom industry. Do you use Open Source products such as Asterisk ? Do you offer any financing or rental options that I can offer to my end users? Can Your PBX easily adapt to the increased customer demands? ... or our post on Portaone. The Business Edition offers traditional telephony and emerging VoIP technologies with powerful features including call recording, conferencing, FoIP, and much more. The Call Center edition allows an organization to effectively start and manage inbound or outbound call campaigns with advanced call center features included. The Multi Tenant edition of PBXware allows service providers to serve the IP PBX market with fully featured, hosted IP PBX solutions and unlimited tenants.